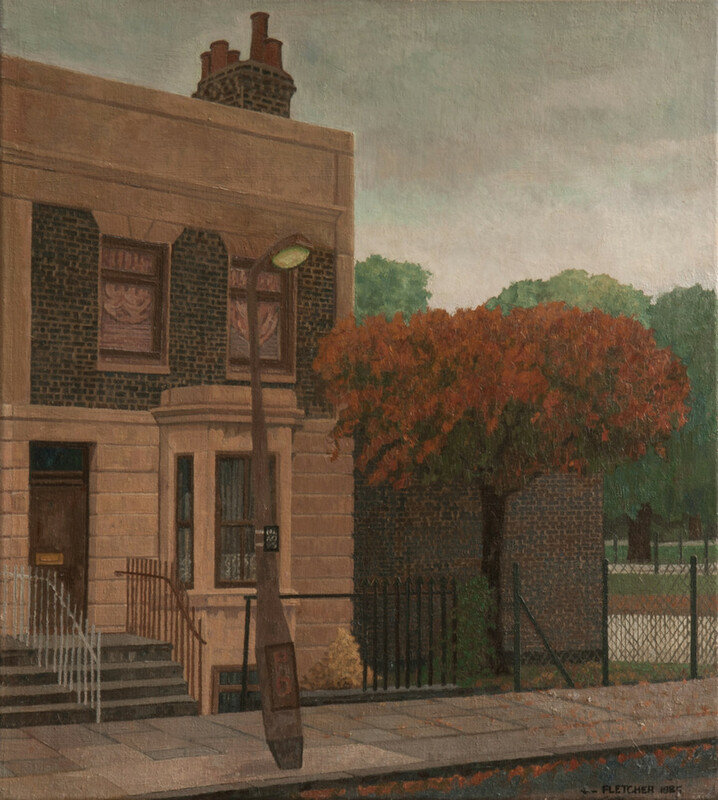 Artist Doreen Fletcher tells the stories behind more of her East End paintings today. 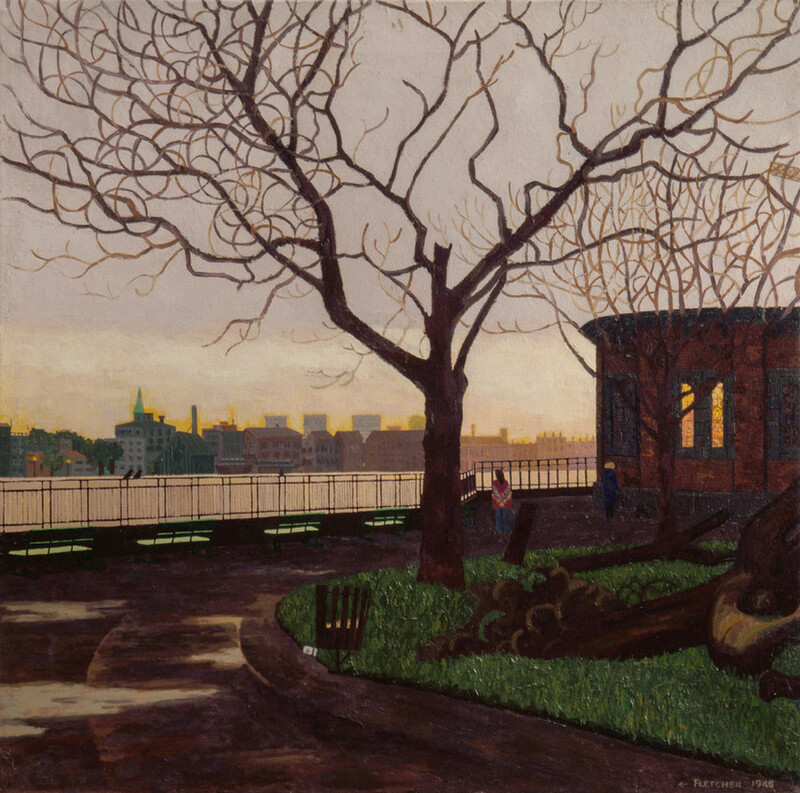 Also, please make an entry in your 2019 diary to join us at the Private View of Doreen Fletcher’s RETROSPECTIVE at Nunnery Gallery, Bow Arts, on 24th January from 6pm. The exhibition runs until March 24th 2019. “The spring of 1985 was very cold in London, but it was even colder in Amsterdam where I was visiting. Fortunately, the museums were warm and welcoming, havens from the outside weather, and the works in the Rijksmuseum entranced me. Yet the experience that remains most vivid in my memory is my trip to the Mauritshuis Museum in The Hague, a short journey from Amsterdam. There, I was transfixed by works from the Dutch Golden Age of Painting, particularly the View of Delft by Vermeer. Dating from around 1600, it is one of the first known cityscapes. I find it difficult to imagine how Vermeer managed to paint such intense focussed works, given that his wife gave birth to fifteen children of which ten survived. He painted very slowly and meticulously and, although respected in his hometown, he was quickly forgotten after his death. “St Anne’s churchyard featured in my life throughout the eighties and nineties. I often took the path that led from the bus stop in the Commercial Road through the main gates and across the yard to the Five Bells. It was here that I met with other artists and friends, following a day’s painting or modelling for life-classes at art colleges. The Five Bells was run by a colourful Scottish family headed by the patriarchal Jim and among the artists who drank there where Jock McFadyen and Peri Parkes, who were both regulars. The biker fraternity, all rather formidable in their black leathers, were also frequent visitors. This all made for a lively mix along with assorted local residents. We engaged in lively debate after ‘lock out’ when Jim would only serve whisky and I must confess that on more than a few occasions I had to be dragged away from heated discussions with other artists, as we voiced the concerns we had been wrapped up in during the day’s painting. In those days I could become very passionate as my working practice progressed. 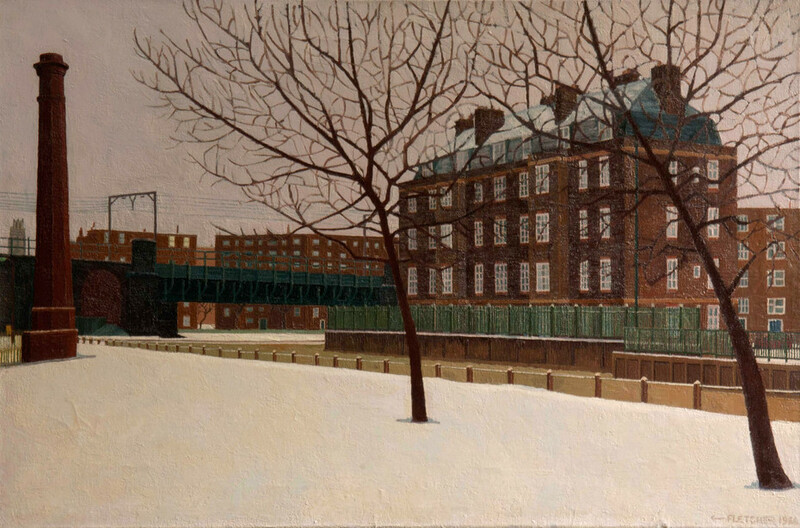 “When I lived in Bow, I loved wandering up and down the tow path past the red chimney, watching the fishermen and observing the change of the trees through the seasons. 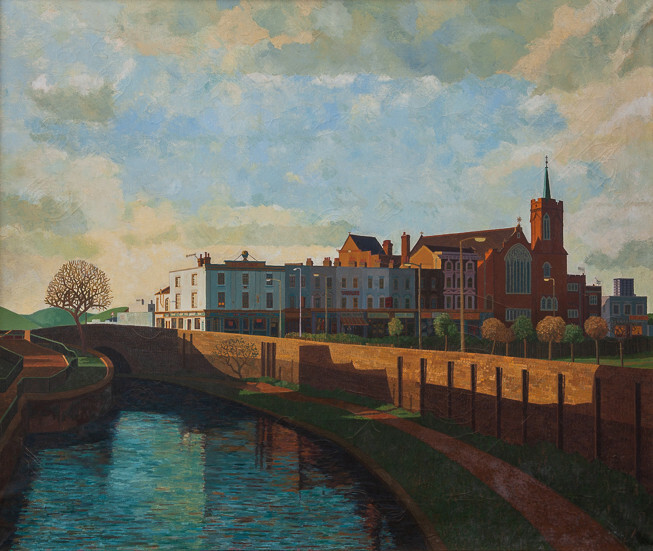 The light of the East End offers a clarity and definition of colour that is very evident along the canal, where the water reflects back the light from the sky. So I was constantly drawn to this subject. “Like many others, I watched the weather man on October 15th 1987, reassuring us that reports of an impending hurricane were a false alarm. After a few glasses of wine with friends, I slept soundly until awakened by a phone call cancelling that morning’s art school modelling session. When I asked why, I was advised to take a look out of the window. Fifty million trees were destroyed that night in England and France. A week or so later, I wandering down the canal, through the park, along Narrow St and onto the Highway. By now it was growing dark and a pinkish glow spread across the sky as the sun dropped below the horizon. As I walked through King Edward Seventh Park, this fallen tree came into view. The “View of Delft” is one of the few paintings that show that the painter was a genius – I’ve seen the same effect with one or two of Turner’s works. Stand square in front of it at the Mauritshaus & look straight at it for about 30 seconds …. and … and … the water in the canal appears to start to move & so do the clouds. 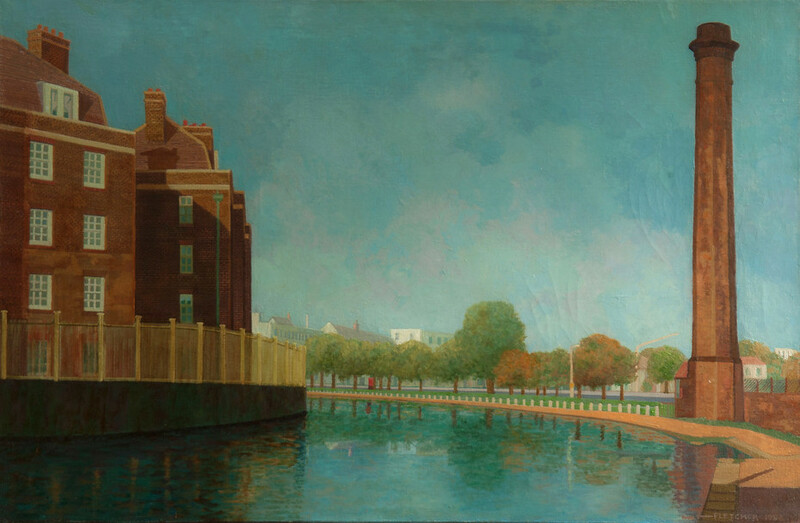 So interested to read Doreen’s thoughts on the ‘View of Delft’ – my favourite painting in the world – I thibnk it shows in her treatment of light. 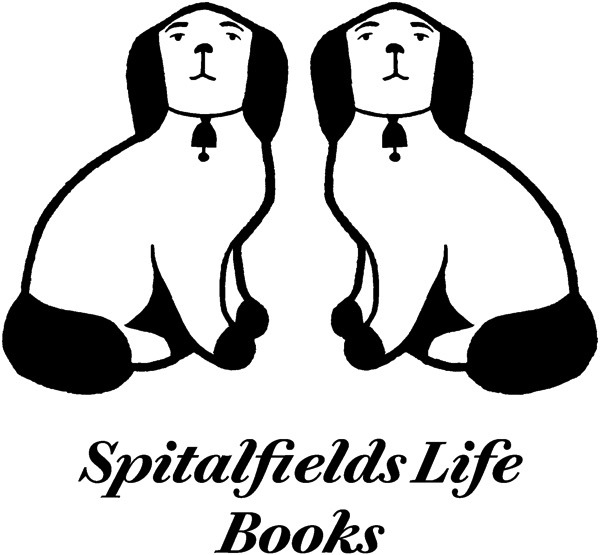 Belatedly, thanks so much for the launch at Bow! 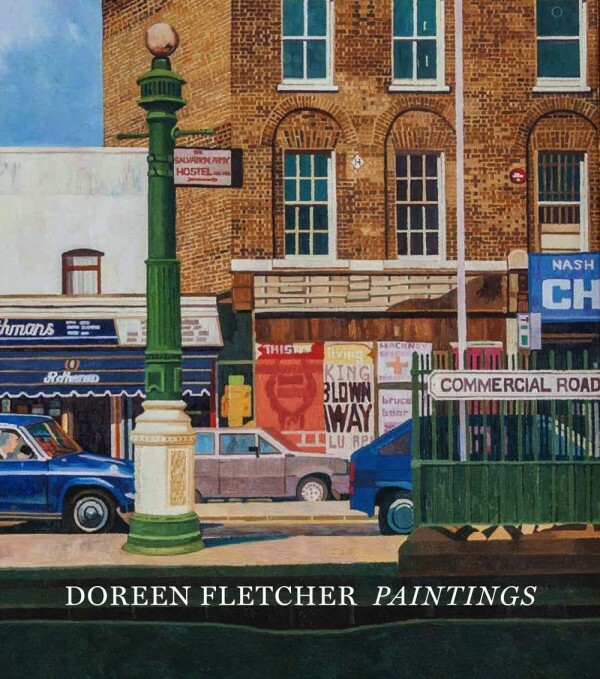 Doreen’s pictures capture, beautifully, the elegiac light of the places she paints. These works should be in national collections and galleries. Just a small point though – it is Regent’s canal, not the Grand Union, that flows through Mile End. The Regent’s canal joins the Grand Union in Paddington. 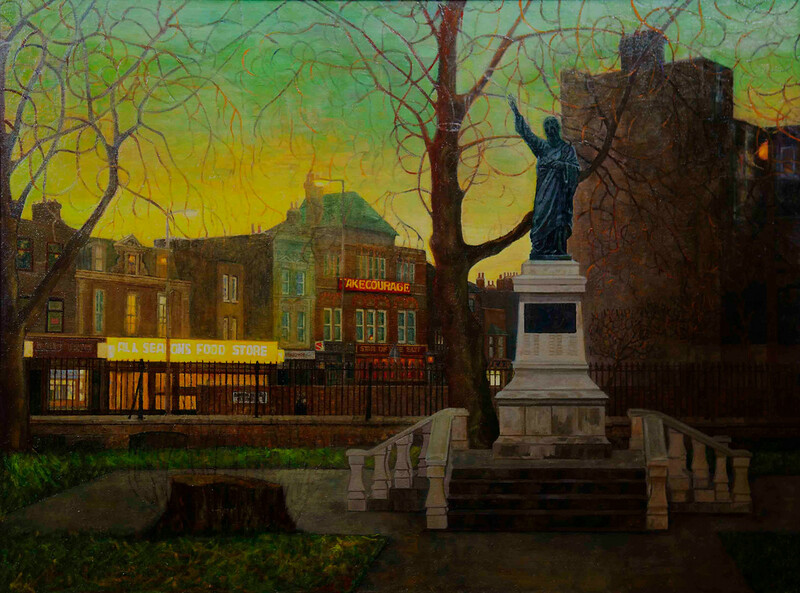 Great paintings of The Real London. Outstanding. Just seen the Great Lady,on UK TV beamed into to me,over here,well done Her,Famously Fame at last Doreen, with a little help from your Friend GA, well done,and good luck.